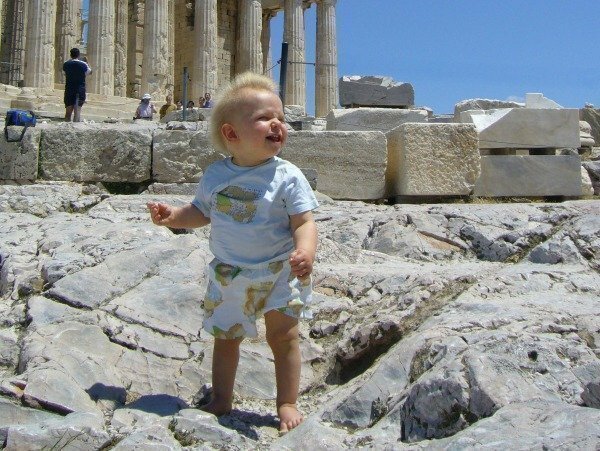 We have always been sightseeing with our children ever since day one and have never pandered to the idea that you can’t visit cultural/historical sights with young kids. Our boys are now 14 and 8 and have visited towns, villages, castles, ruins, museums, monuments and cultural sights in 22 and 18 countries respectively. We’ve found the key to successful sightseeing is that you have to work at making it fun, don’t assume kids will appreciate looking at views/old buildings etc (they won’t!) and above all you shouldn’t try to see too much. 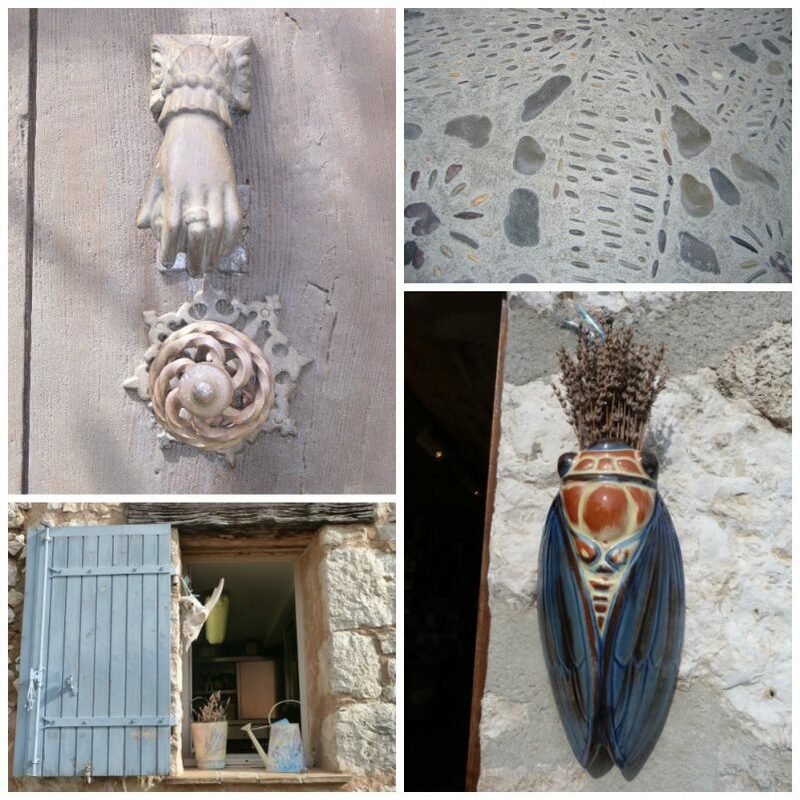 Living where we do now, in the south of France, we are surrounded by many beautiful medieval hill villages, villages perchés, which are just crying out to be explored. They sit so magnificently on rocky outcrops (Peillon) or sheer cliff faces (Gourdon and Eze), some aren’t so high up but still dominate their surroundings with their commanding presence (St Paul de Vence) and some are quite hidden from view (Châteauneuf-Grasse). There are hundreds of them in the Alpes-Maritimes and over the Italian border in Liguria we are forever discovering new ones. And we continually go back to old favourites. Every friend who visits (we get a lot of visitors, believe me) gets taken to at least one which means the boys have been to certain villages like Gourdon too many times to count. And, yes, they are normal kids who groan at the mention of walking around a village again and have to be kicked off their computers/tablets etc but I can honestly say that after every single visit they’ve said “well that was fun!” Ancient hill villages might not initially seem to be very child-friendly; there aren’t any interactive displays or audioguides. There usually aren’t any playgrounds and many don’t even have cafés or shops, they can appear empty, and yet they are always a success with our children and their friends. Here are some of the things we do to make visiting hill-top villages enjoyable. Let the kids run around, play hide and seek in the twisting narrow lanes, the great thing about these villages is that there are no cars. Bring favourite toys to carry around and a small ball to roll down the alleys (in the less crowded places). Make and fly a paper plane, following it where it lands. Encourage older kids to show the younger ones around; let them take responsibility. Point out details in the buildings and paths; play games to see who’ll be the first to spot something unusual on a wall, or the first cat etc. If you’ve been before and you’re showing friends around ask an older child to act as tour guide to the visitors. It makes them feel important and you get to see things from a different perspective. Encourage children to take photos. Always explore the spooky dark tunnels and lesser-taken paths, you never know what you’ll find. Drink from, and splash in, fountains. Float paper boats or leaves in them. 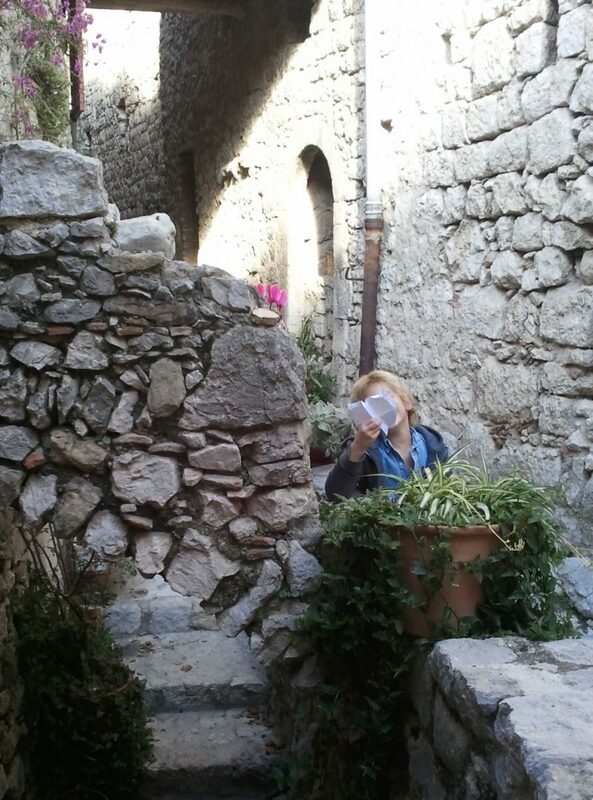 Almost all fountains in these villages are safe to drink from. If there’s no sign then it’s OK. If it’s not safe then it’ll say “eau non potable“. Encourage the kids to enjoy any public art by interacting with it wherever possible. Mimic the pose, climb on it if allowed, discuss it, ask them what it makes them think of (if abstract) etc. Don’t hold back on treats. Stop for ice-creams in all weathers or promise one on the way home if the village doesn’t have any. Go into smart patisseries and chocolate shops to see if they have any freebie samples or to buy something small as a treat. Above all, don’t make it too serious! 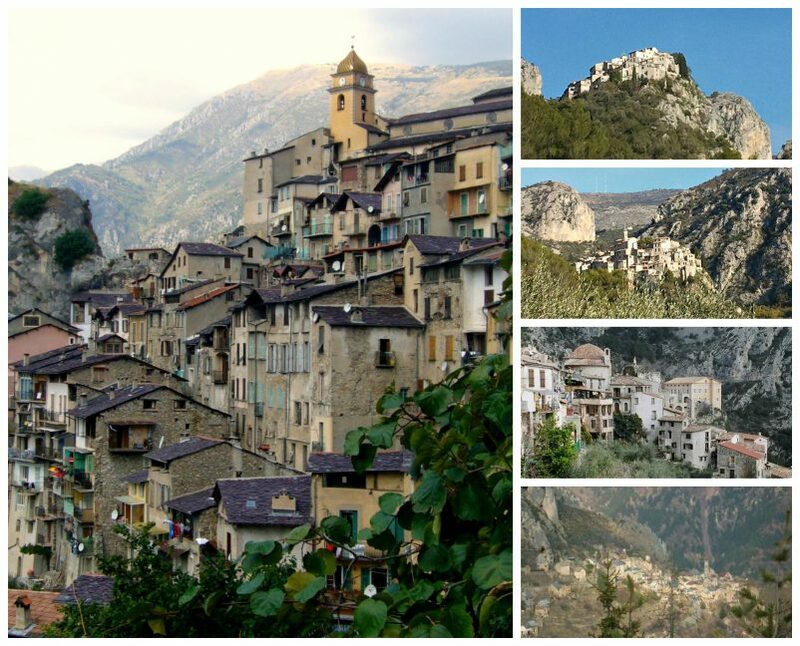 For more detail on perched villages near Nice take a look at my Top 13 favourite hill villages. Do you go sightseeing with your children? Do you have any tips to keep up their interest? I’d love to hear from you. If you liked this, please PIN it! We love visiting hill top villages with our kids, I hope you get to visit some soon Cathy. What a fantastic post. I agree that it’s important to take children to little villages and places that aren’t custom-designed for kids. I love your ideas for making it fun. Thanks for joining in with #CulturedKids! Great idea for a linky, thanks for hosting! these villages are so much more kid friendly than you might initially think and great for running around in! Oh these really are cool! I could totally see the Little running all around these! Jeez, even I would run all around these! Thanks for stopping by Debs! I love this post so much, so I shared it for Travel Tuesday today. I will be sharing it with my kids when they get home from school. We love seeing how other families sightsee and travel the globe. Have you ever watched ‘Travel with Kids’ on youtube? It was really quite spooky, all green from lichen, moss and mould and degrees cooler than outside! I so agree with you Melanie. Thanks fo rhosting the linkup. I’ll be sure to take a look at your post Rosie, thanks for stopping by. Thanks Lisa, it’s a pleasure to put my photos out there! Thanks so much for your lovely comments Maria, I wish you great holidays in Brittany! 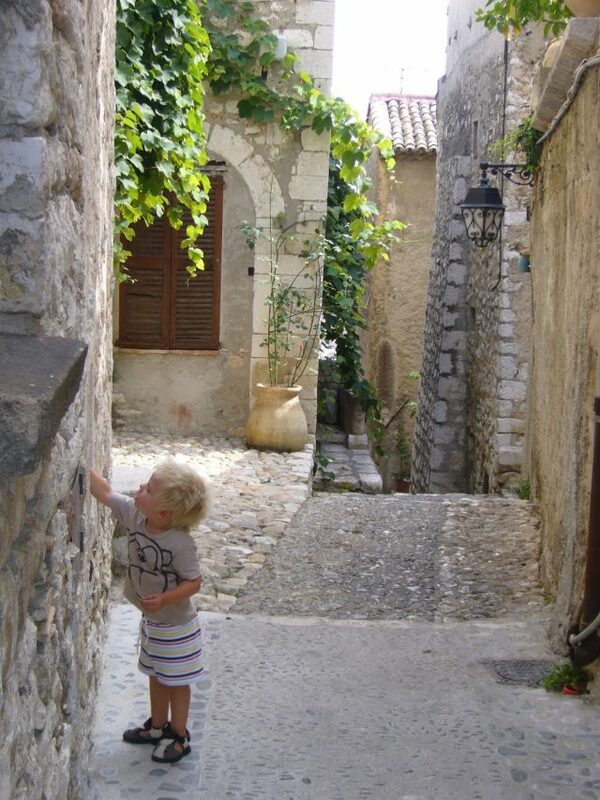 What beautiful villages and what a great place to let children explore safely. The nearest we can get to hillside village is Mont St Michel and when we visited when the boys were tiny we quickly ditched the pushchairs and let them explore in the way you describe. It made what could have seen as a boring for kids trip one great big adventure for them! 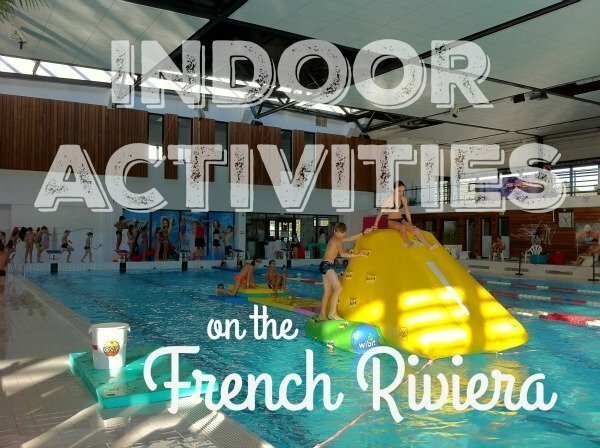 What great ideas to help your kids enjoy the outing! I’m always so impressed with the photos you use with your posts! Thanks for sharing a bit of your world with me! Ahh, loved that green tunnel, Phoebe! So mysterious and interesting! Thanks for sharing these awesome pictures. I think it’s great that you take your kids out to travel! I’m definitely glad my parents took me traveling when I’m younger (and now I’m addicted), even though I probably appreciate it a lot more now that I’m older! If I ever have children I definitely want to take them traveling – I think it teaches kids a lot about the world around them and encourages them to be more open-minded later in life! 🙂 Thanks for linking up with us! Great ideas and lovely photos. I remember when you asked “what is a view”. You sure have an eye for them now. Those are fantastic ideas, it makes me want to go on vacation with you! 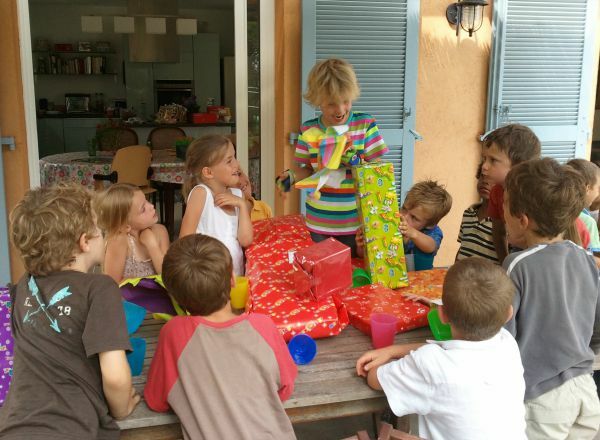 We are a trilingual family living in the Paris area and seeing your photos brings back a flood of memories of vacations in France with our children. We will be vacationing in Bretagne this summer and I’ll be sure to remember all your great ideas! 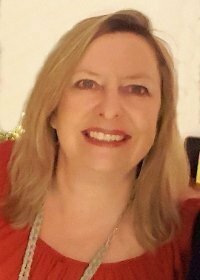 I love this story Beth, thanks for sharing! Kids love being “experts” , it’s sort of like when I suggest they guide our visitors around the village, they get really into it. I should have pointed out that not all ideas are appropriate for all ages. You’re right, when they’re really little, letting kids run off is probably not a great idea, but once they’re older and only in these really quiet traffic-free villages then it can work well. You never have to give up travelling Annie, it just changes a bit. Don’t listen to those negative people! Travelling with my kids has been a real joy. They’re now 19 and 16, and our best family memories are of our trips. My greatest moment was getting them to enjoy visiting the Prado museum. They each chose a Spanish artist, and I told them they were going to be the expert on that artist. My youngest – about 9 at the time – totally bought into it, and we couldn’t leave the Prado without seeing every single Goya! These are all great ideas and awesome tips. We love exploring and sightseeing with the kids. I like the pointing out the details too and it’s the little things they remember. My kids also love taking pictures. Your kids are certainly having a wonderful time. Thank you for showing everyone else that traveling with kids can be fun too. I would love to explore these villages which means that my kids would have to come along with me. I like your suggestions. I’ve tried out a few of them before like offering up treats (hello, chocolate shop) and letting them take photos. I’ve been a little reluctant to let them wander off to play hide and seek as they are great hiders and I fear I shall never find them. But perhaps if we were in a small, quiet village, I’d be more confident that I’d stumble across them eventually. These are some adorable photos of your kids and great ideas! I think making it a fun time for them makes it much more enjoyed for everyone. I absolutely love this! we plan on traveling when we do eventually have children. it’s discouraging the amount of times we here that ‘it’s great you’re taking advantage of this travel now, because once you have kids..’ ugh. I know its possible, just might take a little more forethought and perseverance! I’m sure they’ll get past the groaning and moaning stage…I did! I was brought up travelling the world and sightseeing till it came out of my ears and by my mid teens I actaully chose to do it, going off on my own and showing friends around. There is hope! Totally agree with you Corinne, thanks for adding your experiences. I’m glad to know that yours still groan about going sightseeing! Mine do too, but they do always enjoy it in the end. It’s just getting past the moaning and groaning!! 😉 I hope one day they will appreciate the things they’ve done and seen. Great tips!! I hadn’t thought of a ball or paper airplanes & boats. 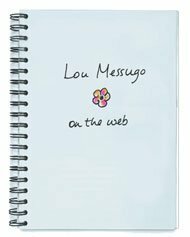 Lou, This post is spot on in all regards! Jim and I took our girls, plus so many extras (children that is) with us on all of our travels, and we still like to travel with kids. Once we were standing in line at the Anne Frank house in Amsterdam, and it was my two daughters with two friends and their mom. The girls were laughing, talking, pointing out things they liked and the whole time the mom kept shushing them. Mind you, we weren’t in the museum yet…just outside waiting in line. Finally, I told her to let them be. I just couldn’t help it. No wonder some kids don’t like to travel. Let them be kids!!!! I love Gourdon too, which is why most of our visitors get taken there and my kids know it like the back of their hands! 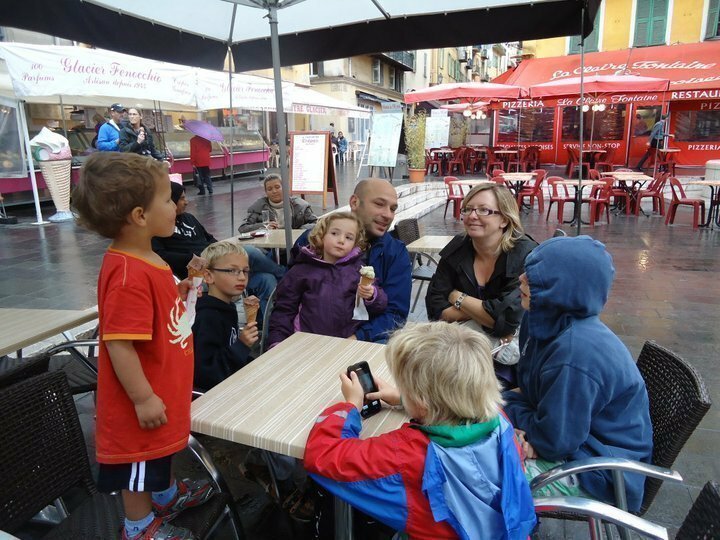 My children also sightsee and it is definately the fun games and ice creams that keep them going. I still remember when Rufus asked why adults always look at views! My favourite one? Gourdon: the view is just stunning!